Boy van Poppel (UnitedHealthcare) was a somewhat surprise occupier of the race lead in the Tour of Britain at the end of stage two. The Dutch sprinter, already wearing the blue and black points jersey in lieu of stage one winner Luke Rowe (Team Sky), finished second in the bunch sprint, which gave him the lead in that competition. 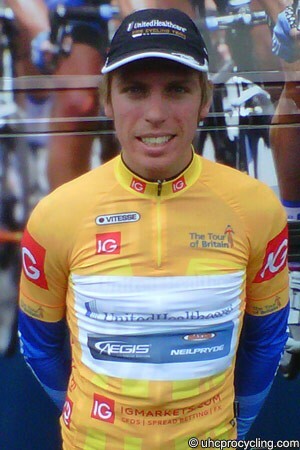 Having visited the podium for that jersey however, he was called back later to receive the gold one as race leader. Rowe - who finished tenth on the stage after leading out World champion Mark Cavendish - was originally adjudged to have held on to his race lead but, having examined the finish further, the race jury decided that the British rider had lost a second on the line, which meant that he was overtaken by stage winner Leigh Howard (Orica-GreenEdge) and van Poppel. “I was very motivated because I had the points jersey and I knew in the back of my mind that I was only a few seconds away from yellow,” said van Poppel afterwards. “So, I did everything I could to try and win today. The Team helped me perfect saving my energy during the day, and they brought me into an ideal position to the sprint. UnitedHealthcare’s directeur sportif Hendrik Redant was understandably delighted with the somewhat unusual turn of events, and paid tribute to his riders for their hard work in the stage. “The boys were working well for van Poppel and kept him in the front of the race so he could preserve his power for the sprint,” he said. “Robert Förster took Boy to the front of the group in the final kilometres of the race, enabling Boy to sprint in ideal circumstances. He did a great job in the sprint and managed to get 3rd place.